Evan Ducharme showed his collection, ‘Atavism,’ at the inaugural Indigenous Fashion Week Toronto. The collection explores the idea of clothing as a form of protection, whether it be from the elements or the social landscape. We spoke with Evan to learn more about his work and how he uses it to reimagine Indigenous identity. When did you first realize you were interested in fashion? My ‘Mama,’ who has since passed, she would always tell these stories of me sitting at the kitchen table with her drawing dresses. She was a seamstress in the community, she made baptism dresses, wedding dresses, and I would always poke around in her sewing box, and look at all the treasures that would end up in there. As I got older, I had a few women who really fostered that interest, some were teachers, one especially was my mother’s aunt who really gave me my base fashion knowledge, how to cut, how to sew, finishing, I still use those skills today. There are things she taught me I didn’t even learn in fashion school. Tell me about your journey from fashion school to owning your own business. I moved to Vancouver in 2010 to attend fashion school, and it all took off from there. Through the years, I’ve worked for other companies as well. I think there’s a lot of value in that for sure, just to be involved in someone else’s process, to get to see different ways of working with a team. But my own business and my own artistic practice was always the most important thing. But I didn’t even plan on starting a company when I finished design school. 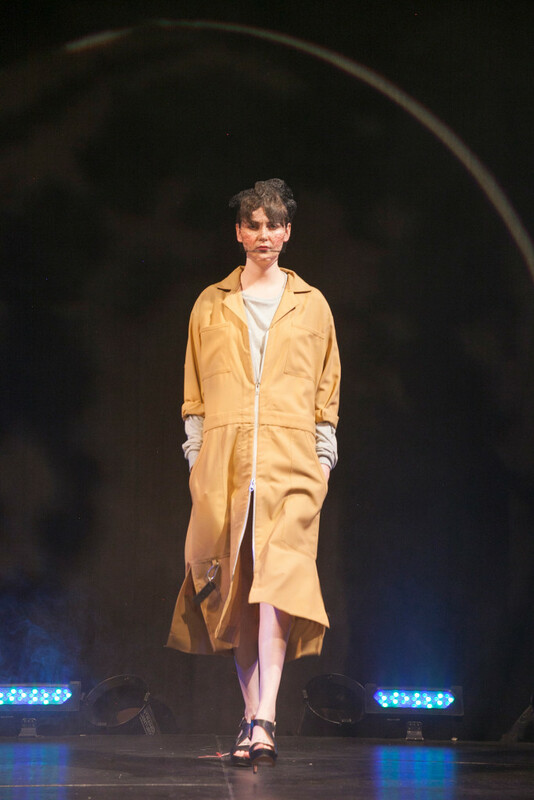 I presented my graduate collection during a competition, Fashion’s Night Out Vancouver (which I won). From there, I caught the eye of Myriam Laroche, the founder of Eco Fashion week in Vancouver, and she requested I show my collection at Eco Fashion Week. I’d been working with Eco Fashion Week for two years before that, as an intern, and then I went to the show, and and that’s really when my company started to take off. It’s been weird, my journey through fashion has been like, things have found me. I haven’t sought them out, but I’ve taken them in and followed whatever path was laid out for me. How would you describe your clothing and style? I would say it’s Indigenous aesthetic and Indigenous ethics from a contemporary Metis perspective. I think it’s really important to assert a contemporary point of view as an Indigenous person because, around the world, even in the lands we still occupy, we’re seen as a thing of the past, that we’re extinct, that we’re not living and thriving, and creating and being, and it’s really important to me to show a contemporary point of view, and still honour our ancestors and traditional practices that are so fruitful for me in my work. You make clothes for men and women? I make clothes for a customer. I’m my client, and so are my friends. For the first few years of my company, it was difficult to nail down what the Evan Ducharme woman was, and then I realized the Evan Ducharme client is neither man or woman, they transcend gender. My clothes definitely tip femme of centre, that’s always just been a part of me as a human being, just really attracted to the feminine, the power of the feminine, and that has transpired in my work. Why are events like IFWTO important? I’m really excited about these kinds of events. First I showed at Vancouver Indigenous Fashion Week (VIFW) last year and it was a completely different experience from anything I’d ever done before. It’s so amazing that we now have these spaces that are Indigenous-led, from an Indigenous point of view. We’ve taken back some of the agency in how we’re portrayed especially in the fashion industry.